Some of us enjoy what we do for a living, many of us do not. Then there are those who’s sole purpose in life is their career. 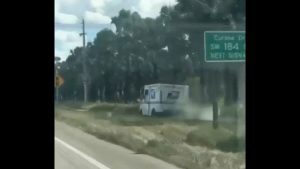 A United States Postal Service driver out of Miami is one of the latter. While we appreciate the dedication to living up to same day delivery, we can’t help but wonder if there should be a special custom traffic sign for those that want to go off roading. Perhaps reminding drivers to stay on the roadway at all times. Or maybe “no off-roading permitted.” Something to remind drivers that despite the desire to beat traffic, there’s no need to pretend a USPS truck is an all terrain vehicle.